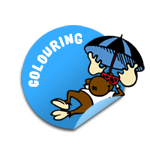 Click on the buttons below to browse the BC Parks selection of resources. 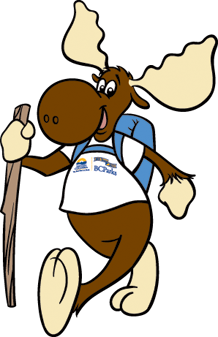 Jerry the Moose is based on a real, extraordinary moose who was born in Endako (near Burns Lake) and was orphaned as a small calf. A park officer found the little orphaned moose and took care of him through the summer, fall and winter of 1960. Then, when a moose researcher found out about Jerry, Jerry was moved to Wells Gray Provincial Park so he could become the subject of an important scientific study for the next two years. 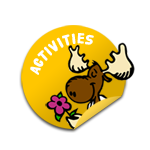 Jerry helped this scientist understand what the moose�s favourite food was, how much he ate, how fast he, and specifically his antlers, grew. Jerry spent most of his days sleeping and eating. During his first summer, Jerry gained an amazing five pounds (2.25 kg) a day! The parks crew at the time had to go into the backcountry to find Jerry�s meals. Apparently, Jerry�s favourite food was Falsebox, which was one of the less common plants and therefore the most difficult to find. Luckily, he also liked willow and aspen, which were more plentiful. In the summer, Jerry ate mostly leaves and ate, on average 300 pounds (136 kg) of food a day! In the winter, he mostly ate woody material and averaged only 20 pounds (9 kg) of food a day. 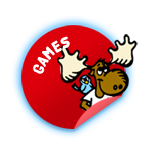 Jerry the mascot debuted at Expo 86 for BC Parks� 75th anniversary celebrations and has made regular visits to B.C. parks and at special events, educating park visitors about parks. 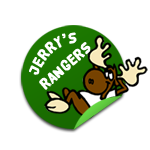 The "Jerry�s Rangers" program is an environmental education program for children aged five through twelve, run by BC Parks interpreters. As a fun and educational way to encourage your kids to become stewards of the environment, you can download Jerry�s Promise and have your children sign it, or use it as discussion points before taking your kids or students into a BC Park.